On Palm Sunday ("Cvjetnica", but also called Poma Sunday), in Dubrovnik an the rest of the littoral olive and palm twigs, as well as (lately) eggs and pinica (sweet bread) are carried to church to be blessed. The blessed twigs are then stuck into the eaves of the house, crucifixes or holy pictures, in the garden or on fields for prosperity and a good crop next year, they are being replaced by new blessed twigs. The intertwining of palm twigs is being done only in the southern part of Croatia - thus the Dubrovnik region. The formed twigs are called "pome" or "palmice". For those who don't knit them themselves, they can be bought at the open markets the week before at affordable prices - although, the bigger and more magnificent the poma is, the higher the price. To create a poma it is necessary to pick the green shoots of the palm's heart. When intended for church, the whole branch is plaited - for the rest, it is cut into smaller pieces. Knitting them is not a simple job and only excellent workers succeed in keeping the wattle firm. In Christianity, the egg is a symbol of a new life that Jesus made possible with His resurrection. 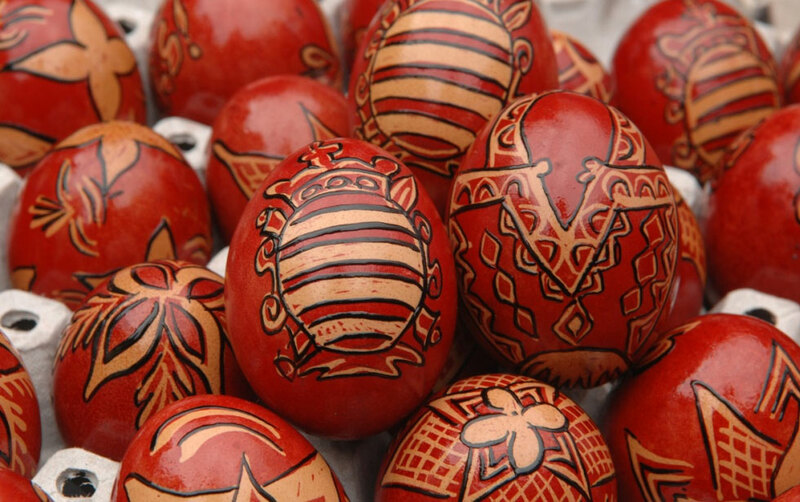 Decorating the eggs with bee wax - drawing ornaments or writing messages is a tradition still being done to this day. The bee wax covers the eggshell and prevents those parts of getting colored afterwords when being cooked in either dye or, traditionally, in onion peels which create a beautiful red color. Frequent motives are hearts, starts, branches, birds and various written wishes. Beautiful eggs are kept for decorating homes and as gifts to friends and relatives who visit - it is a tradition to bring an egg so you can take one you like as well. In the Rupe ethnographic museum there is a glass display with decorated eggs. On march 11, 100 000 stamps with the poma were printed and released!